The R&S SMB100B and the R&S SMBV100B specifically address the requirements of RF semiconductor development, telecommunications, and aerospace & defense. Rohde & Schwarz introduces two new compact midrange signal generators that offer versatility and performance in a very small footprint. The R&S SMB100B analog RF signal generator and the R&S SMBV100B vector signal generator set new standards in their class, offering outstanding spectral purity, unprecedented output power and easy, intuitive touchscreen operation. The R&S SMB100B and the R&S SMBV100B specifically address the requirements of RF semiconductor development, telecommunications, and aerospace & defense. With the predecessor models R&S SMB100A (analog model) and R&S SMBV100A (vector model), Rohde & Schwarz established the portfolio of compact benchtop signal generators up to 6 GHz, integrating uncompromising performance into a ¾ 19" form factor. This successful family of signal generators has been further enhanced and improved to create two new models. The new R&S SMB100B analog RF signal generator and the R&S SMBV100B vector signal generator again set standards in the midrange class. The instruments' excellent spectral purity and very low phase noise result in superior measurement accuracy. Their maximum output power tops all previous records. The compact, lightweight generators are easy to transport and take up minimal space in the lab. The new signal generators are available in various configurations. With frequency ranges from 8 kHz to 1 GHz, 3 GHz and 6 GHz, they can be tailored to address diverse applications. Customers can choose among three different RF output power stages to scale the maximum output power to their specific needs. The generators can deliver up to +34 dBm output power (at 1 GHz carrier frequency) without an external amplifier, which simplifies the test setup and eliminates downtime due to calibration. The R&S SMB100B and the R&S SMBV100B offer precise, calibrated RF output power for all configurations. The two signal generators feature excellent signal quality. This makes the R&S SMB100B analog RF signal generator ideal for radar and receiver tests in the aerospace and defense sector, as well as for CW-based production tests on wireless devices and infrastructure. The R&S SMBV100B additionally offers superb signal quality for vector-modulated signals, with a powerful baseband section with up to 500 MHz bandwidth. It comes with options for all major digital communications standards, such as 5G, cellular IoT, LTE, WLAN IEEE 802.11a/b/g/n/ac/ax and Bluetooth 5.0. Signals for these digital standards can be generated directly on the instrument; no external PC is required. This makes it quick and easy to vary signals and parameters. The R&S SMBV100B also provides envelope tracking and digital predistortion (DPD). Signals with up to 2 GHz bandwidth can be modulated via external I/Q inputs. Internally generated 160 MHz WLAN IEEE 802.11ac signals exhibit a measured EVM as low as –49 dB. Wideband signals benefit from the generator's excellent I/Q modulation frequency response of 0.1 dB (measured) across the entire 500 MHz bandwidth. All this helps developers ensure outstanding product quality even for wideband communications systems such as 5G. The signal generators feature a well-conceived upgrade concept. Desired functions can in most cases be added via software keycodes. For example, modulation standards, output power and, with the R&S SMBV100B vector model, even the RF frequency range and modulation bandwidth can be upgraded as needed without requiring customers to send in their instrument to a Rohde & Schwarz service center. This procedure is easy, saves time and money, and gives customers maximum flexibility. It makes the R&S SMB100B and R&S SMBV100B signal generators a safe investment, well prepared to meet the needs of tomorrow. 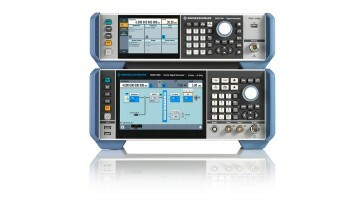 Customers worldwide appreciate and rely on the exceptional, industry-leading quality of Rohde & Schwarz T&M products. Advanced production technologies and pioneering design are key to this prominent market position. Purchasers of a new R&S SMB100B or R&S SMBV100B benefit from a three-year warranty. The R&S SMB100B analog RF signal generator and the R&S SMBV100B vector signal generator are now available from Rohde & Schwarz.